THIS IS NOT A MOD! Since I'm now trapping at 107 MPH, upgrading the rotors and pads is a SAFETY UPGRADE! Not a MOD!! yeah, that's it! LOL! I up graded mine last week to the EBC ultimate rotors and red pads. Congrats. Looking forward to seeing them all bolted up! Yes. I must admit. The braking is under par for this car. Sent while out & about with my SHO on Tapatalk!! Very much so, the EBC's I haven't put thru the paces yet. Still less then a hundred miles on them, but the initial bite is much improved. But I definitely believe the 2013's brakes can be adapted to our cars. Perhaps Torrie can look into a put together a package. I definitely believe the 2013's brakes can be adapted to our cars. Perhaps Torrie can look into a put together a package. From what fellow EB Forums member Taurus Builder said, I wouldn't count on it. He said that he personally inspected the 2013 brake upgrades while the new models were rolling down the production line and said that the changes were "extensive" and there is a whole helluva lot of work that would need to be performed (to possibly do the retro) and even then, that wasn't a guarantee they'd work. Me personally, no clue. Would love to see someone tackle a project such as that. In the interim, there are the various after market companies that make different rotors and pads, and TCE even makes a complete disc/rotor upgrade pkg but it's a few thousand for their set up if I recall correctly. I think fellow EB forums member First SHO (Mike) has their set up on his SHO, should probably ask him if he doesn't chime in, in here. But then there's the cost factor too of retro fitting 2013 components onto prior model years, and at some point I'd think that y'all would break even at that point considering what TCE offers (which would be a better set up anyhow IMO as you had your choice of either 4, or 6 piston front calipers). If you upgrade rotors and pads, and add lighter wheels and tires... you will be good to go... unless you are tracking the car in a parking lot, or motorsports track. 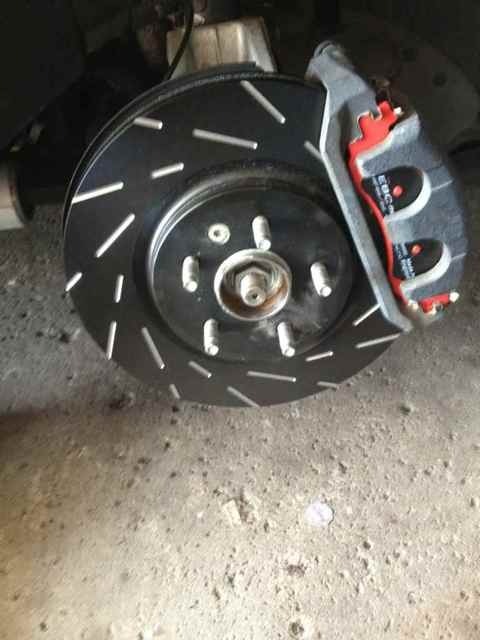 I love the look of the EBC rotors and have always had good experience with their brake pads. @ Mike I feel much better since I'm now not the only one with MPG covers. @Scrming check out the caliper cover thread I posted a copy of my e-mail to MPG concerning the rubbing problem with the caliper clips. Now you tell me!!! LOL! yes, we ran into the clip issue... Scott (MRT) figured out the spacer and we had clearance... BUT, that was when the rotors were COLD! I noticed they started to touch a bit after heavy braking in the shut down area! LOL! Idling down the return road, with the windows open you can here the tick tick as the rotor touches the clips...HOWEVER, under normal driving around the rotors don't get hot enough to expand as much! LOL! Ok... couple of quick snap shots! New rotors and pads work great... much more confident feel!!! Looking better all the time!! !